The fifth parliamentary year in the Sindh Assembly was marked by the passage of 47 bills – 43 government and four private member bills. Most of the bills (40) were passed in the last session of the fifth parliamentary year. These included five government and two private member bills to increase salaries, allowances, and other perks of the Chief Minister, Speaker, Deputy Speaker, ministers, special assistants, and MPAs. The Sindh Assembly held six sessions during the fifth parliamentary year, including the budget session, meeting for 55 sittings. The total duration of the observed sessions was 136 hours and 30 minutes, each session on average lasting 22 hours and 45 minutes. Of the passed bills, 27 were new pieces of legislation and 20 amendments to existing laws. Additionally, the Lyari and the Malir Development Authorities (Revival and Amending) Bill 2009 was introduced. Four ordinances on local government, transplantation of human organs and tissues, and two seeking amendments in the Sindh Civil Servants Act were laid before the house during the fifth parliamentary year. A month before the house completed its constitutional term, the provincial assembly passed a bill to repeal the Sindh Peoples Local Government Act 2012, which had essentially introduced two local government systems in the province. With the repeal of the act, the local bodies system of 1979 was reinstated. MQM lawmakers staged a walkout and parted ways with the ruling PPPP, joining the opposition benches. Similarly the MQM members protested against the passage of the Jinnah Sindh Medical University Bill 2013, which was reintroduced in the last session. The new bill gives the control over admission policy to the government. The PML, NPP and ANP lawmakers protested and staged a walkout over the passage of the Sindh Civil Servants (Amendment) Bill 2013, which regularized the out-of-turn promotions in the province, especially in the police department. The protesting lawmakers had pointed out that the matter of out-of-turn promotions in Sindh was pending before the Supreme Court. Apart from passing a bill against domestic violence on the International Women’s Day, the provincial assembly passed the bill on free and compulsory education. The house also passed a bill to protect the properties of minorities in the province. Additionally six bills were passed to set up new universities and four others to establish institutes on art, science and technology, medical and visual sciences. The subject of health was touched upon by the passage of two government bills – one to mandate the sale of iodized salt to public and the other to promote breastfeeding for better infant nourishment. After the passage of the 18th Amendment, the house passed bills to adopt the federal laws on organ transplant and industrial relations. The house amended the sections 2, 17, 23, 24, 28, 30, 31 and 33 Tenancy Act of 1950 to ensure cordial relations between the landlord and the tenant. However in section 24 (c), the words “but the landlord shall not take any free labor from tenant or a member of his family against his will” have been omitted. The National Coalition against Bonded Labor (NCABL) opposed this amendment in the tenancy act, terming it unjust and one that “amounts to sanctioning bonded labor”. In order to encourage and assist the business community in the face of economic crisis, the term of use of land allotted to private parties has been extended from six months to five years under the Colonization of Government Lands (Sindh Amendment) Bill 2011. MQM left the treasury benches and one of its lawmakers was appointed Leader of the Opposition on March 5, 2013, only days before the house was dissolved. The newly-appointed Leader of the Opposition attended seven sittings. 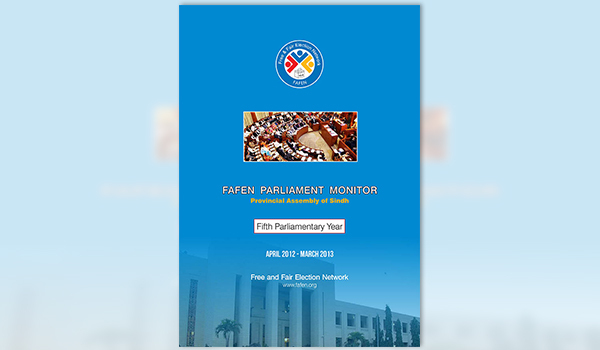 MPAs’ interest in the proceedings in terms of attendance was low in the fifth year. On average, in the 166-member house, 36 MPAs (22%) were present at the beginning, 75 (45%) at the end and 95 (57%) members were observed at the time of maximum attendance. The quorum, found lacking on several occasions, was rarely pointed out. The Chief Minister attended 16 sittings. The Speaker presided over 61% of the assembly business, the Deputy Speaker 32% while the remaining time was chaired by the Panel of Chairpersons. The parliamentary leader of MQM attended 42 sittings, followed by PML(FB) and PPPP leaders who were present in 30 sittings each, ANP leader (28), NPP leader (27), PMLF leader (20) and 11 sittings were attended by the PML leader. Out of 166 members of the house, 84% (140) participated in the proceedings in the fifth year. Of these, 65% only debated the agenda while 19% submitted as well as debated the agenda items. All female members (30 MPAs) and 80% male members (110 MPAs) participated in the debates during the year. The house adopted 47 out of 58 resolutions in the fifth year, condemning the incidents of sectarian violence in Quetta and Karachi, burning of Christians’ homes in Lahore, demanded probe into the Bhoja plane crash, called for protecting properties of minorities and reposed confidence in Prime Minister Yousaf Raza Gillani when he was convicted for the contempt of court by the Supreme Court. In the 39th session, the house adopted eight resolutions to oppose the construction of Kalabagh Dam. Besides paying tribute to Pakistani women’s struggle for their rights on the International Women’s Day and resolving to increase female literacy rate to 80% by 2015, the house also passed resolutions to give Sindhi, Balochi, Punjabi and Pashto languages national status. An in-camera sitting was held during the last session over law and order in the province after the house passed a resolution demanding a briefing on the measures to address the “complex situation in Karachi”. Top police officials – Inspector General of Police and Additional Inspector General – briefed the members. However MQM lawmakers boycotted the briefing midway through the sitting. Nine adjournment motions were taken up during the year on increase in cases of target killing in Karachi, land grabbing, WASA’s inability to tackle water related issues, failure of the government to uphold the rights of the poor, and a blasphemous film on social media. MPAs spoke on various issues on 202 points of order, consuming 12% of the proceedings total time. The members asked 416 questions during the year. Most of the questions were directed to the ministries/departments of Sindh Technical Education and Vocational Training Authority, Home Department, Mines & Minerals Development, Local Government, Food and Agriculture received. They responded to nearly 97% of these questions. Out of six questions of privileges submitted in the fifth year, three were taken up by the house. The Sindh Assembly witnessed eight walkouts and 13 protests during the fifth year. The total time consumed by these protests was about five and a half hours or 4% of the overall duration. All parties -government and the opposition – staged protests during the year. MQM members mostly protested over the law and order situation in Karachi while the PPPP legislators protested over the non-implementation of the Supreme Court verdict in the Asghar Khan case. MPAs protested and walked out in two sittings against the proposed sale of islands by the provincial government. Members of all parties staged a walkout over the non-provision of MPA priority program by the Ministry of Finance. The PPPP, PMLF and NPP lawmakers protested twice against the construction of Kalabagh Dam.